A Patient Story Workshop…… | Which me am I today? I’m part of a group that meets every now and then for the East Riding Clinical commissioning Group. Nicki Sparling, Assistant Director of Quality and Improvement, asked me ages ago to be a member and yesterday picked me up to attend the latest meeting. The aim is to co-produce a patient story process that is consistent across all organisations and review how patient stories are used in each organisation and for what reason. I think I became involved when I spoke to the CCG board around the appalling experience I had when I moved to this area……but I might be wrong. I know I spoke to them about something and can’t imagine it being positive! We want them to hear the reality of the services they provide from the people who experience them. So, mug in hand, many people didn’t turn up. We were expecting people from all over Yorkshire…..Some had sent apologies but others hadn’t…..never good and so impolite. Lots more from around the region were supposed to be attending but few actually appeared. I often wonder why? Is it workload, lack of interest? We started this work a year or sp ago but had to be shelved until now. So many changes going on which took precedence. So today we’re picking up the agenda and hopefully it will be actioned. The important aim is to support any patients who speak to the CCG, or whose story appears anywhere but the other key important point is for something to come out of the situation and it not become a tick box exercise. 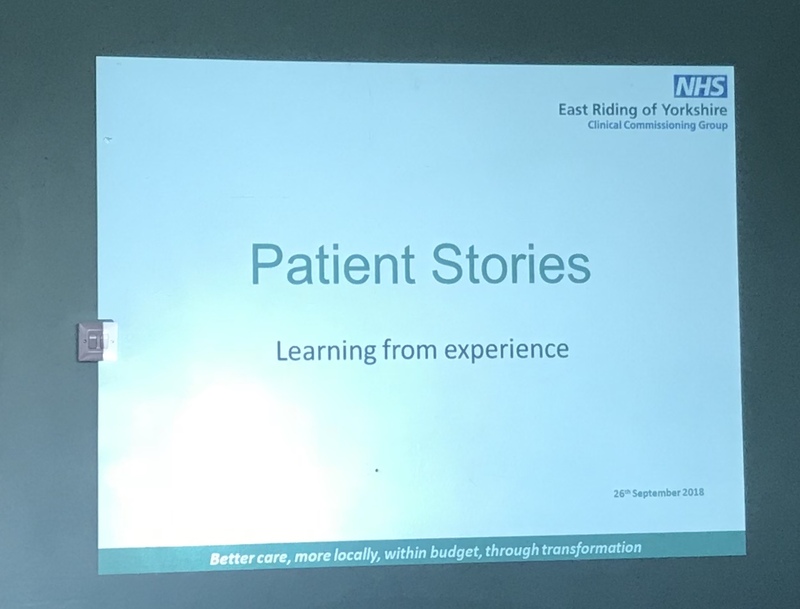 And this applied to the Trust as well as CCG.Some areas use Patient Stories already but it would be good to have consistency and having an open mind as to how we give people the option to tell their stories, both good and bad. Videos, someone else reading out, an article or being their in person……lots of options. We all gave examples of ideas to gain stories. I mentioned the Willerby Research Team and the stories they receive on the advantages of research. We need to have positives and negatives and the CCG can use them to promote ‘listening’. The ‘You said, we did’ attitude for both good and bad stories. I said what it mustn’t be is, simply collecting stories – no point in that at all. There has to be a value and an outcome for people sharing their stories. We got onto the subject of payment for people who take the trouble to attend meetings. The staff are all paid, but the lay person isn’t. If payment is too complicated I suggested using local businesses to donate gift vouchers and have good publicity for them as well. After another cuppa tea had arrived…(everyone else pointed in the direction of the tea machine…..😂😇, )we went on to talk about the next steps. 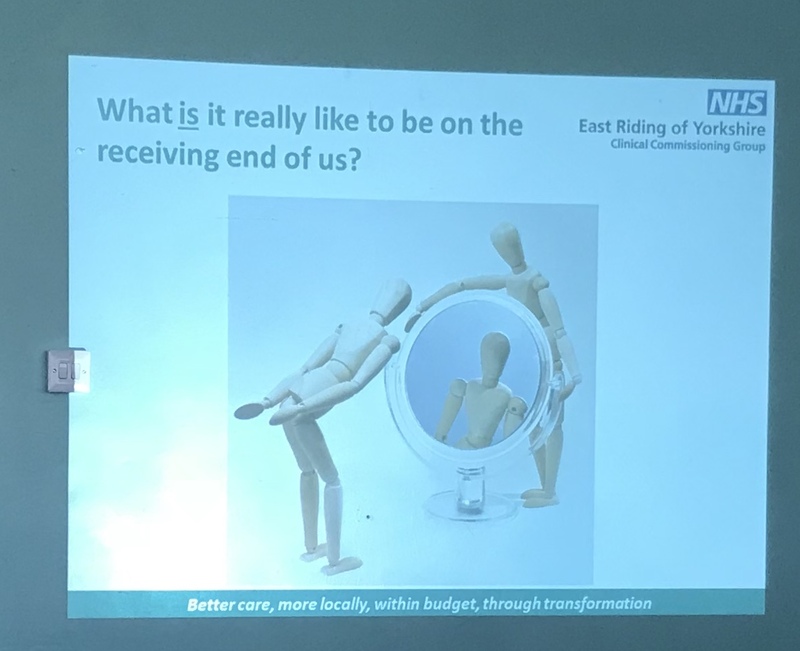 As a CCG, they don’t have direct contact with patients but other providers will already be doing this so we need to tap into others already doing this – no point in reinventing the wheel……we want to establish principles and a process that each area can use….. It can all revolve around permissions and sharing those stories. 2.30pm arrived and I was flagging after such a busy few weeks…..and no more typing exists. Continuing to be inspired by all your hard work. Wendy, I so admire you. I try and read all your posts, and am in awe of what you do.